The Last Winter of Dani Lancing is so much more than a murder mystery. There’s a ghost story, crooked cops, and it will mess with your mind. There are so many twists and turns that just when I thought I had things figured out, a new detail would pop up and I’d be thrown again. Dani was kidnapped and brutally killed when she was away at university. Her murderer was never found. Her mother has gone nearly crazy trying to solve the case herself, her father sees and talks with her ghost, and her best friend Tom has devoted his life to finding the killers of girls like Dani. Her parents’ marriage falls apart and no one ends up any closer to finding the truth about happened to her. Some might find the time jumping bothersome, but I think it works for this novel. Little pieces are revealed a page at a time, but not enough information is known until the very end. It kept me guessing and wondering what really happened. It also gave me the chance to see life before compared to life after. I felt the impact more when I read how happy they were as a family when Dani was little and then immediately after read about Jim, Dani’s father, talking to her ghost. It made her father’s sadness and her mother’s obsession all the more apparent. Dani was fascinating to me as a character. When she was alive, she portrayed herself as a perfect child, working hard and not getting into trouble. It became very obvious early on this was not her true self, though, and that the truth of who she was would give a greater clue as to what happened her than any case file could. There was one dramatic twist at the end that I felt was out of place and unnecessary, but every other turn had me scrambling to figure out where I was headed next. 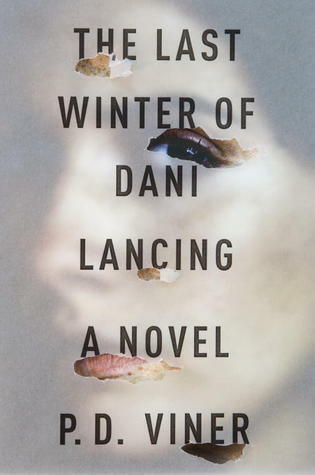 The Last Winter of Dani Lancing is a gripping psychological thriller that will shock you. You’ll be looking for answers on every page and you won’t find any until the very end. This entry was posted in Mystery, Thriller, and Suspence and tagged Mystery/Thriller, Phil Viner, Suspense.